Howea forsteriana is notable for the particularly skinny trunk and graceful spread of leaves. 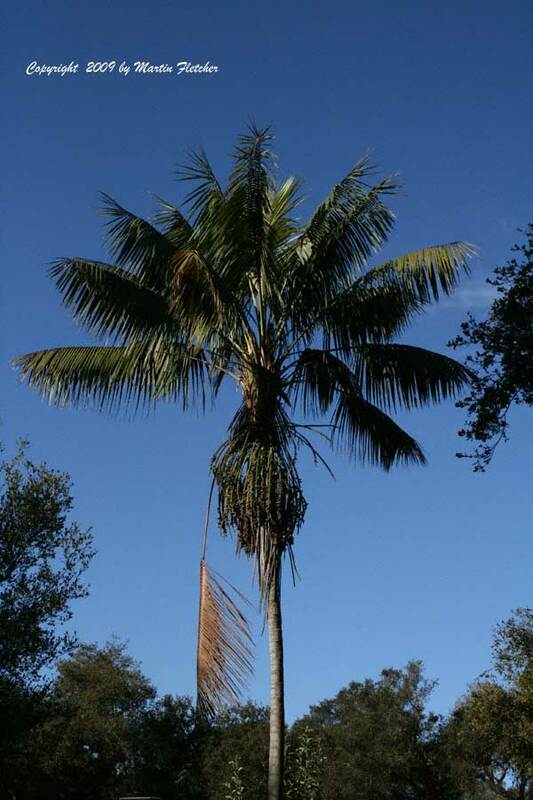 The Kentia Palm is relatively slow growing, though given enough time it can reach the 30+ feet that this one has attained. Howea forsteriana is tender if the temperatures drop much below freezing. That leaves much of coastal Southern California as a nice setting for this gem of a palm. In a windy location Howea forsteriana will hold up better than most any other palm. The Kentia Palm is often used indoors due to the clean lines, skinny trunk and slow growth. Kentia palms have been a status symbol as well as a darn good house plant. If there ever was a short list of plants with romantic histories, the Kentia Palms should surely be on that list. Captain Cook, Mutiny on the Bounty, Queen Victoria are all part of the tale. If a guy can figure out how to grow tropical plants in Michigan on a production scale, there is plenty to be learned. Howea forsteriana - Kentia Palm. High resolution photos are part of our garden image collection.